Use this calculator to see the impact flies can have on your cattle. Strive for 200 flies per cow or fewer. Any number above that is too high and could be hurting your bottom line. The horn fly takes blood meals 30-40 times per day with an efficient cutting and digging mechanism. Delivering a painful bite to its host, the damage resulting from horn fly bites can include irritation, annoyance, sores (leading to secondary infection), blood loss, and stress. Stress caused by horn flies increases heart rate, respiration rate and rectal temperature, supporting the risk for increased disease challenge. For small fly populations, count the number of flies on one side of the animal. For larger fly populations, count the number of flies in a representative space and then multiply the number of spaces occupied by flies on that animal. It is easiest to check horn flies in the early morning when they are usually on the upper side of the animal. If horn flies have exceeded the economic threshold of 200 flies per animal, consider controlling horn flies by giving them a Purina Wind and Rain Storm Fly Control Mineral. It’s no secret the horn fly is one of the biggest nuisances to cattle. During peaks, as many as 4,000 horn flies can call a cow’s hide home. At 30 blood meals each, that adds up to 120,000 bites per cow per day. Not only are these flies irritating your cows, but with production losses for the U.S. cattle industry estimated up to $1 billion annually, they’re also biting away at your profits. High horn fly populations can cause blood loss, increased cattle stress and annoyance. This can cause cattle to use their energy to combat flies, change their grazing patterns and cause cattle grouping. 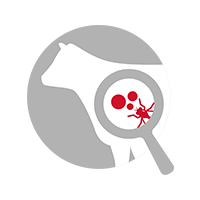 The result of poor fly control may be reduced weight gains, decreased milk production and reduced calf weaning weights. One of the most convenient and consistent fly control methods for cattle is Purina® Wind and Rain® Storm® Fly Control Mineral. This cattle mineral is available in both loose and tub forms and contains Altosid® Insect Growth Regulator (IGR). Feed 30 days before the last frost of spring through 30 days after the last frost in the fall. As cattle consume mineral, the IGR passes through the animal and into manure, where horn flies lay their eggs. The IGR breaks the horn fly life cycle by preventing pupae from developing into biting adult flies. The result? A reduced horn fly population which can help improve herd health and performance, resulting in more profit back in your pocket. Try Purina® Wind and Rain® Storm® mineral through the Feed Greatness® Challenge or visit your local Purina® dealer. Want to learn more about cattle fly control? Check out these resources from Team Purina.